Posing for a photo before the Oct. 28 Childhood Obesity and Public Health Conference are, from left, principal investigator for the CDC grant and registered dietitian at the LSU AgCenter Denise Holston-West, Director of 'CHEF' camps and Associate Specialist for Nutrition at the SU Ag Center De'Shoin York, and grant co-investigator and assistant professor at Pennington Biomedical Research Center Stephanie Broyles. Baton Rouge, La. 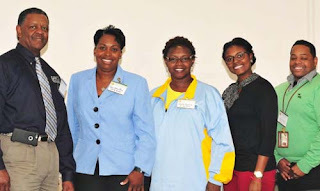 – Dr. Gina Eubanks, Vice Chancellor for Extension at the Southern University Agricultural Research and Extension Research Center, announced the establishment of “Creating Healthy Enjoyable Foods” (C.H.E.F.) cooking camps and community and school gardens as part of the Southern University Ag Center’s efforts in a collaborative two-year, $1.25 million grant from the U. S. Centers for Disease Control and Prevention (CDC). The announcement was made during the 2015 Childhood Obesity and Public Health Conference held at the Pennington Biomedical Research Center on Oct. 28. The C.H.E.F. cooking camps are designed to teach youth basic cooking principles and nutrition education based on the USDA’s, “MyPlate” food guidance system and the 2010 Dietary Guidelines. The grant, which was awarded to the LSU AgCenter and partner institutions Southern University Ag Center, LSU’s Pennington Biomedical Research Center and the Louisiana Department of Health and Hospitals, will operate in Madison, St. Helena and Tensas Parishes. The institutions hope the grant will reduce obesity and chronic diseases in the rural Louisiana parishes, which according to the CDC, all have a 40 percent or greater adult obesity rate. For additional information on the Southern University Ag Center’s C.H.E.F. cooking camps or our community and school garden programs, call 225.771.2242. Baton Rouge, La. – The Southern University Ag Center will kick-off its’ Balance Ball Chair Initiative on November 2 as part of the Ag Center’s Health and Wellness Initiative. For this study, five SU Ag Center employees will replace their regular desk chairs with a balance ball chair for six months. During the six month period, participants will be required to use the ball chair for one hour each day and log-in the actual amount of time spent using the chair. The participants will also have their anthropometric data measured before using of the chair, and periodically throughout the six month duration. Participants will meet in the Atrium of the SU Ag Center at 10 a.m. on November 2 to receive information and tools for the study. This initiative is the first of several health and wellness initiatives that will be sponsored by the Southern University Ag Center. Fashion Fights Poverty Participants show off their Fashion!!! Baton Rouge, La. 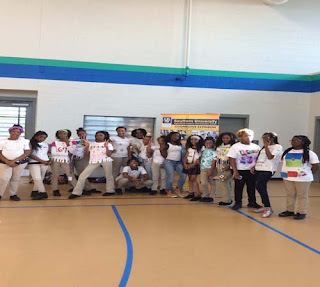 – Coghill School in partnership with Southern University Ag Center’s Youth Educational Support (Y.E.S.) 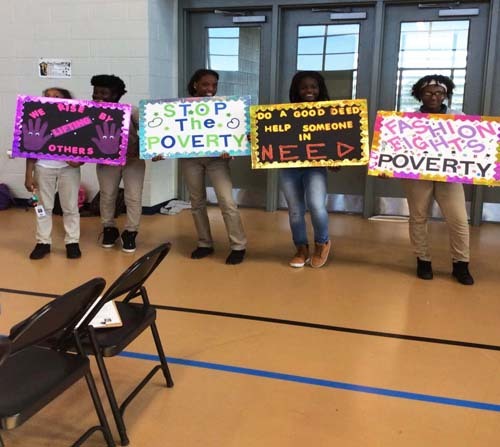 after School Program hosted their first Fashion Fights Poverty Fashion Show. The Show was held on September 30th at Coghill School’s gym, with an admission fee of a canned good. Participating youth designed and cut their t-shirts and created their own fashion. All youth entering the t-shirt contest were judged and competed for 1st, 2nd and 3rd places in the show. All canned goods and proceeds were brought to the New Orleans Rescue Mission. Youth also created Fashion Fights Poverty Posters with Poverty Slogans. The 1st, 2nd and 3rd place winners took home a free box of Kane’s gift cards and a design kit to decorate other fashions and shirts. Assistant Extension Youth Development Agent Krystal Sugulleh Stewart coordinated the event. Baton Rouge, La. 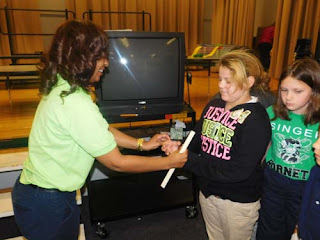 – The National 4-H week was held on October 4th-October 10th. 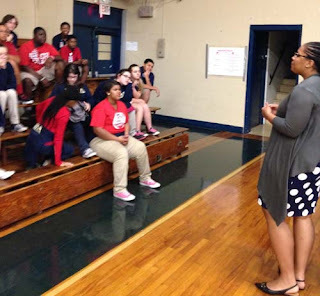 St. Peter Claver’s 4-H club meeting was facilitated by Assistant Extension Youth Development Agent Krystal Sugulleh Stewart along with club’s Volunteer Leader. 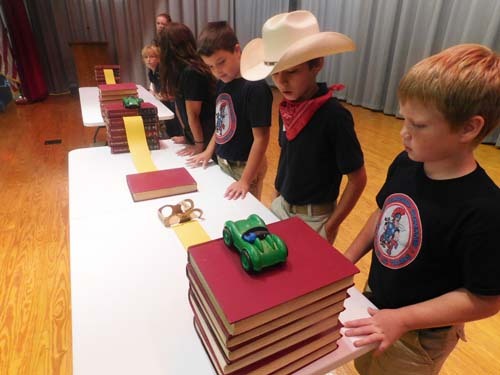 4-H youth club members participated in elections of officer leader positions. Youth practiced and enhanced their public speaking skills by presenting their election speeches in front of their peers. 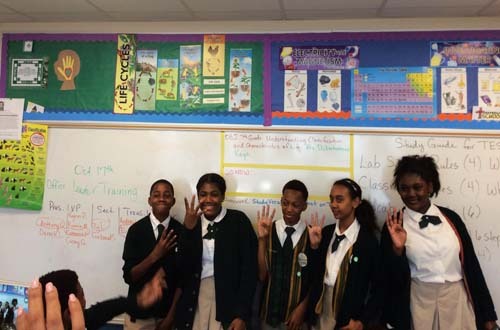 Youth officer leaders for St. Peter Claver’s 5th, 6th and 7th grade Science classes were elected. 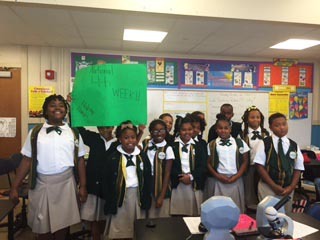 The club members concluded their 4-H club meeting by creating a 4-H poster that states what 4-H Grows in Orleans Parish. As displayed on the poster, 4-H grows friendships, minds, kindness, diversity, helping hands, service and leaders. Youth 4-H club members posed for a photo with the National 4-H Week Slogan #4-H Grows Here in Orleans Parish. Baton Rouge, La. – Two Southern University alumni employed by Tyson Foods, Inc., Claric Grimes, and Lorenzo Ware, Research & Development, returned to encourage Animal Science students to perform well as they prepare for the future. Also in their midst was former Meat Science Instructor Orlando Phelps. The current instructor for the Meat Science Class is Curtis Chisley. Grimes and Ware work in Springdale, Arizona while Phelps spends his retirement in Mississippi. At least four students – Jennifer Brown, Miracle Brown, Cameron Monroe and Antonique Nixon were also exposed to the possibility of seeking a career at Tyson Foods. The meeting held at the SU Ag Center included sampling of Tyson Foods products by participants. The Southwest Center for Rural Initiatives, located in Opelousas, is a satellite campus of the Southern University Ag Center. For more information, please contact Krystle J. Washington at Krystle_Washington@suagcenter.com. Baton Rouge, La - The USDA/Natural Resources Conservation Service (NRCS) in Louisiana has planned a series of soil health workshops across the state during the third week of November. Farmers and ranchers are invited to participate and learn more about the importance of soil health, cover crops and forage management in pasture and row crop production. Attendees will receive Louisiana Master Farmer Program CEU's. Guest speakers will include Ray Archuleta, Conservation Agronomist from the NRCS East National Technology Center in Greensboro, North Carolina, as well as several soil health and cover crop specialists. NRCS will also demonstrate the benefits of improving soil health and cover with a rainfall simulation trailer. Although there is no cost to attend, pre-registration is required. November 17, 2015 - Louisiana Cotton Museum, 7162 Highway 65 North, Lake Providence, Louisiana. To register, contact Deborah Morris at (318) 559-2604, Ext. 3. November 18, 2015 - Reeves Bible Church, 408 Emma Avenue, Reeves, Louisiana. To register, contact Rose Sharbeno at (337) 239-2193, Ext. 3. November 19, 2015 - West Feliciana Fire Protection Center, 9892 West Feliciana Parkway, St. Francisville, Louisiana. To register, contact Jean Vicknair at (225) 683-5496 Ext. 3. The NRCS provides reasonable accommodations for individuals with disabilities. To request special accommodations, call the phone number listed for the corresponding date at least ten days prior to the event. "Our hearts go out to those Louisiana farmers and ranchers affected by recent natural disasters," said Agriculture Secretary Tom Vilsack. "President Obama and I are committed to ensuring that agriculture remains a bright spot in our nation's economy by sustaining the successes of America's farmers, ranchers, and rural communities through these difficult times. We're also telling Louisiana producers that USDA stands with you and your communities when severe weather and natural disasters threaten to disrupt your livelihood." 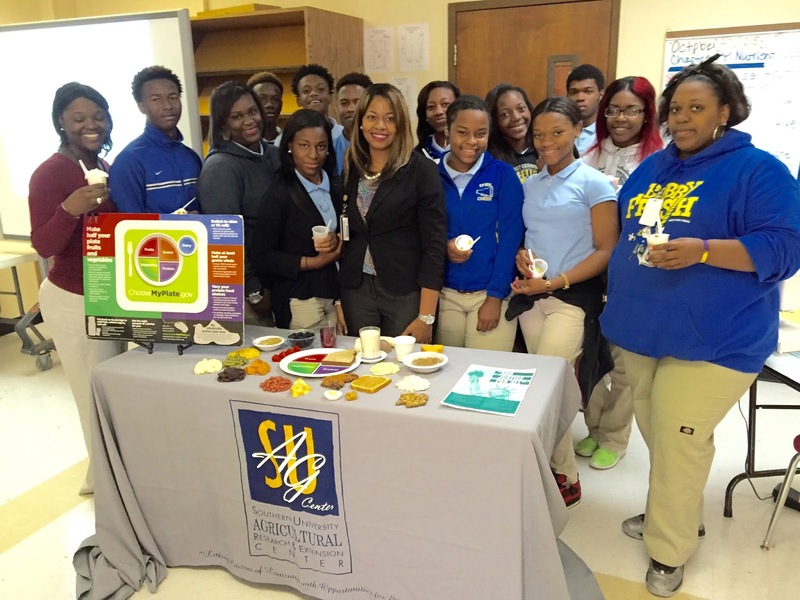 East Baton Rouge and East Feliciana Parish Nutrition Educator Kiyana Kelly poses for a photo with students from East Feliciana High School on Oct. 22 after discussing the MyPlate food guide and USDA Dietary Guidelines with the students. Baton Rouge, La. – The Southern University Ag Center’s Families First -Nutrition Education and Wellness System (FF-NEWS) recently launched its fall nutrition curriculum in schools and communities across the state. East Baton Rouge and East Feliciana Parish Nutrition Educator, Kiyana Kelly, reviewed MyPlate and USDA Dietary Guidelines with 9th -12th graders at East Feliciana High School on Oct. 22. After the presentation and class discussion, students participated in a hands-on food demonstration preparing fresh fruit parfaits. “I like trying new things when Ms. Kelly comes to our class.” said sophomore Kenan Moore. Moore shared that he was also a Junior Horse Show Posse rider with the SU Ag Center and is considering a career in Agriculture. The City of Opelousas Mayor Reggie Tatum and School Principal Mrs. Daphne Guillory were on hand to welcome participants, faculty and students to the event. The Northeast Elementary School Science Teacher, Mr. Brandon Book revealed to the participants why science is important and the need for students to continue to embrace it. About 157 students from Northeast Elementary School participated in the event. Students conducted the two-part ‘Motion Commotion’ experiment at the school’s court yard. They used every day materials – including a toy car, modeling clay, ruler, calculator and a cell phone – to explore physics in the real-world. In the first phase of the experiment, youth constructed a simulated runway to analyze the speed, momentum and kinetic energy of a car in motion, and explored the science behind the car’s collisions. In the second phase, they led an experiment using the same physics principles to demonstrate the consequences of distracted driving. “It is important for teens to learn basic concepts related to Science, Technology, Engineering, and Mathematics and how the subjects can be related to driving,” said William Augustine, Extension Associate and Science Day Event Organizer. “Providing youth in rural areas with an interactive and engaging science experiment is always a joy; however, it’s imperative to also provide the students with a lesson they will need and utilize for a lifetime.” added Dr. Wanda Burke, Director, SCRI. All teachers, students, 4-H leaders and guests were recognized at the conclusion of the event. 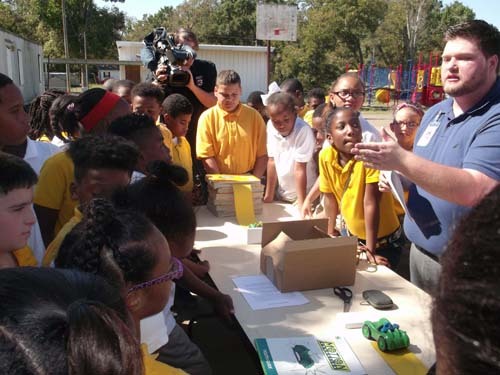 Television coverage of the event aired on KATC 3, October 15, 2015. 4-H NYSD is the world’s largest, youth-led science experiment. The national day is dedicated to engaging kids with science through a hands-on, interactive learning experience that gets youth excited about science, technology, engineering and mathematics (STEM). The event also spotlights the many ways youth in St. Landry Parish are engaging in 4-H Science programs year-round. The 2015 activity was designed by Oregon State University Cooperative Extension in partnership with Vernier Software & Technology and selected as the winning experiment for the eighth annual 4-H NYSD. The event’s national sponsors are Hughes (HughesNet satellite Internet), Lockheed Martin and U.S. Cellular. Baton Rouge, La. – The Southern University Agricultural Research & Extension Center (SUAREC), in collaboration with Louisiana State University Agricultural Center and Mobile Fashion Camp, will host the “Fall into Fashion” sewing workshop. 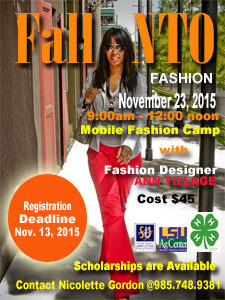 Ann Tillage, renowned Fashion Designer and Owner of The Sharmooz, will teach participants - ages 7-18 - about fashion, styling, and provide a glimpse into the burgeoning Louisiana Fashion scene. The workshop will be held November 23rd, from 9 a.m. – 12 p.m. at the LSU/SU Ag Center, 305 E. Oak Street in Amite, Louisiana. The event will also provide participants with basic design and sewing skills and hands on experience designing a one of a kind purse, tote, or maxi skirt. “During the workshop youth will gain a better understanding of the varied career paths that they can attain, by gaining life skills in these areas. We work to instill self-esteem and provide practical skills that can be used in a future trade or career,” said Tillage. Registration is $45; only 15 participants will be accepted for this session. Scholarships are available upon request and the deadline to register is Nov. 13. Ann Tillage is the founder and owner of The Sharmooz, a boutique company that specializes in Satin Beauty Accessories. She comes from two generations of seamstresses, designers, business owners, and a long line of fashion forward, entrepreneur-minded women. So when she created a product that every woman needs, she committed to making it available. Ann left corporate America to become a stay-at-home mom. During that time, she noticed that her infant son was developing an unsightly bald spot from rubbing his head against crib sheets and his carrier, and she couldn’t stand the thought of him losing that beautiful baby hair. A seamstress at heart, she used her knowledge of fabric to invent a solution—a Charmeuse Satin headrest that she playfully called a Sharmooz. Soon all her mother’s friends wanted a Sharmooz of their own, and her company was born. For more information on the workshop or to register, contact Nicolette Gordon in the Tangipahoa Parish Extension Office 985.748.9381, or St. Helena Parish Extension Office 225.222.4136. 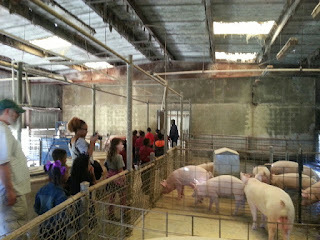 Bernard Terrace Elementary School students visit the SU Ag Center's Swine Unit on Oct. 22. Stephanie Elwood speaks to students about plant safety inside one of the SU Ag Center's greenhouses. Elwood picks fresh herbs for the students to smell and taste during a tour of the SU Ag Center's Sustainable Urban Agriculture Demonstration Farm on Oct. 22. Baton Rouge, La. – Forty-five first, second and third grade students in the Bernard Terrace Elementary School’s gifted program held a field trip on the Southern University Ag Center’s campus on Oct. 22. 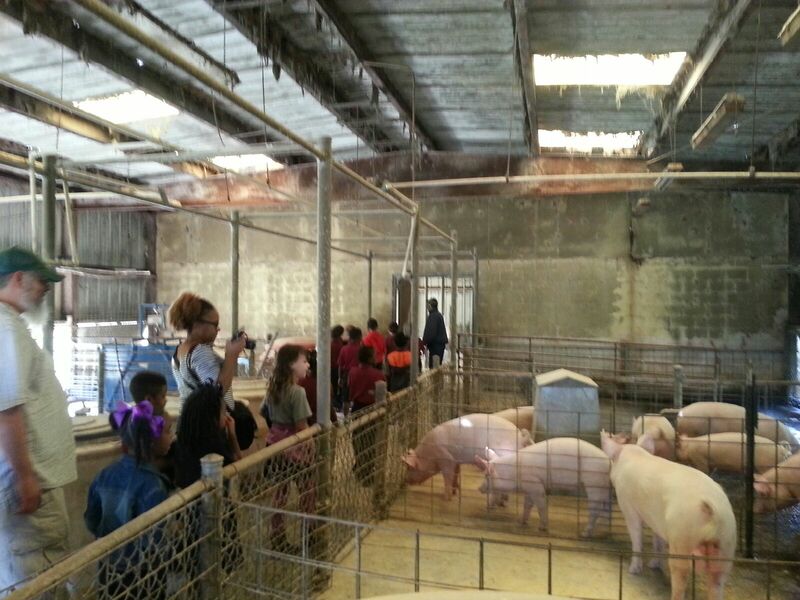 During their visit, the students in Mr. Bender and Mrs. Williams’ classes toured the SUAREC’s Swine Unit facility with the leadership of Mr. Kevin Belizard. SU Ag Center Assistant Extension Specialist Stephanie Elwood led tours of the Center’s greenhouses and Sustainable Urban Agriculture Demonstration Farm, which is maintained by Dr. Dawn Mellion-Patin and Zanetta Augustine. The tours provided the students with an opportunity to see where researchers study plants and the types of plants and herbs that are grown in the greenhouses and on the Urban Farm. “There are two important questions that you need to remember any time you are in someone’s greenhouse or garden,” said Elwood. “The first is can I eat this? Some plants can make you sick or even kill you if you eat them. The second is did you spray anything on this? So always remember to ask those two questions,” warned Elwood. The students ended their visit by having a picnic in the Urban Farm. Special thanks to Kevin Belizard, Joyce Tubbs, Mila Berhane, LaKeeshia G. Lusk and Stephanie Elwood for making this field trip a success. The Southern University Ag Center’s Sustainable Urban Agriculture Demonstration Farm is a show-and-tell garden for the public. This educational garden gives information on vegetable varieties, planting instruction, composting techniques, and other relevant information. Farm tours are available throughout the year. To schedule a tour, contact Dawn Mellion-Patin or Zanetta Augustine at 225-771-2242. 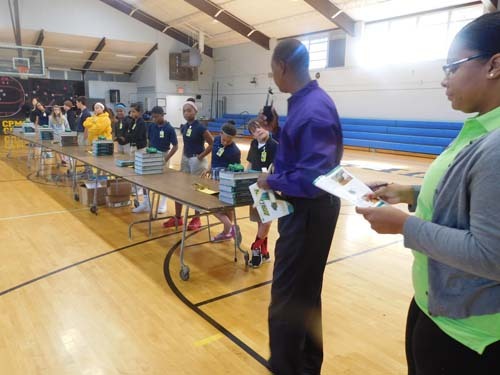 Students from Singer Elementary, East Beauregard Elementary, and Merryville High School in Beauregard Parish, and Church Point Middle School in Acadia Parish, participated in the events. Students conducted the two-part ‘Motion Commotion’ experiment using every day materials – including a toy car, modeling clay, ruler, calculator and a cell phone – to explore physics in the real-world. In the first phase of the experiment, youth constructed a simulated runway to analyze the speed, momentum and kinetic energy of a car in motion, and explored the science behind the car’s collisions. In the second phase, they led an experiment that uses the same physics principles to demonstrate the consequences of distracted driving. “4-H has aimed to teach students science for over a century, it is important that students in the 10- parish rural areas that the SCRI covers have the same access to STEM activities. When going into these communities, we [Goldie Jordan and William Augustine] are looking at future scientist, engineers, physicist, etc. 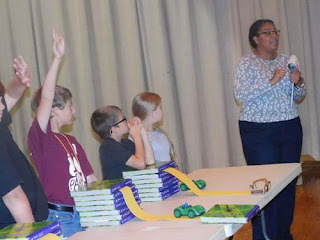 and it’s amazing to see the excitement on their faces as we expose them to the world of science in a fun and interactive way.” said Krystle J. Washington, Science Day Event Organizer at the Southwest Center for Rural Initiatives. In addition to the experiment, Washington also adds a public speaking portion at the summation of the project. A student has to use scientific terms to adequately explain what took place throughout the experiment to their peers. 4-H NYSD is the world’s largest, youth-led science experiment. The national day is dedicated to engaging kids with science through a hands-on, interactive learning experience that gets youth excited about science, technology, engineering and mathematics (STEM). The event also spotlights the many ways youth in East Baton Rouge Parish are engaging in 4-H Science programs year-round. SCRI is a satellite campus of the Southern University Ag Center located in Opelousas. During the upcoming weeks, we look forward to bringing the 4-H National Youth Science Day experience to the remainder of our ten-parish region. 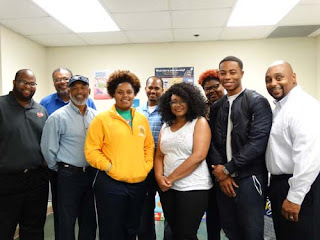 Krystle J. Washington, Extension Educator/ Community Development Southwest Center for Rural Initiatives Southern University Ag Center can be reached at (337) 943-2410. Baton Rouge, La - The Agribusiness Council of Louisiana Leadership Forum: Leadership and Action, held its annual forum on Wednesday, October 21 at the USDA- ARS- Southern Regional Research Center in New Orleans. The primary goal of this organization is to enhance the competitiveness of Louisiana Agriculture in the 21st Century. 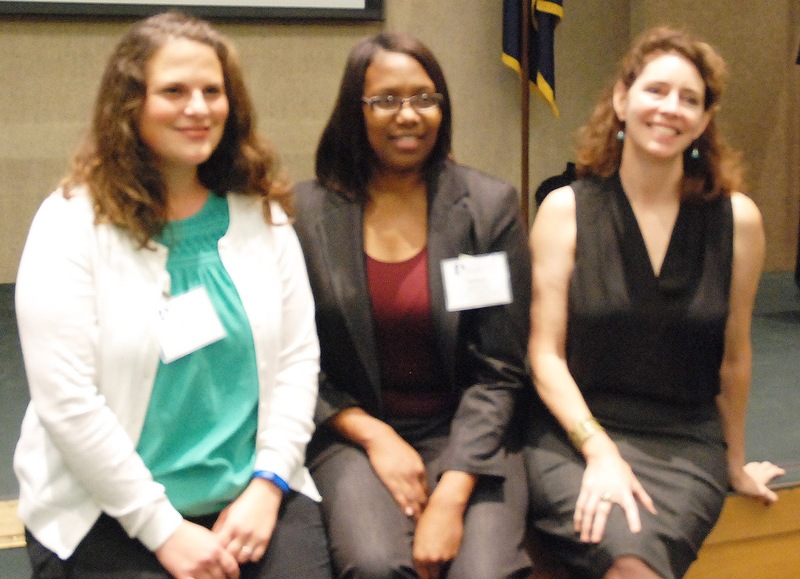 This year’s forum was themed: Ag Leadership & Animal Rights as a Mainstream Phenomenon. Dr. Bernard Rollin, University Distinguished Professor, Colorado State University delivered the keynote address, and Dr. Douglas Steele, Director, Texas AgriLife Extension Service discussed "Leadership Issues & Efforts from Other Locations/States." 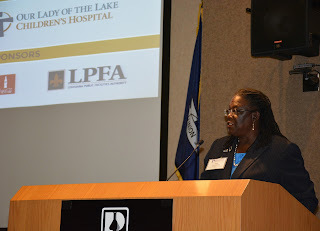 Approximately 75 people from across the state of Louisiana attended the meeting. Dawn Mellion-Patin, Ph.D., Agriculture Specialist, served on the planning community for the forum. Other participants from the SU Ag Center included Renita Marshall, DVM; Zanetta Augustine, Extension Associate; and Christopher Rogers, Director of Technology Services. The Agribusiness Council consists of a group of progressive individuals whose primary purpose is to expand the scope of Louisiana Agriculture by promoting Research, Education, Business Climate and Trade. This forum was sponsored by the Agribusiness Council of Louisiana, the Audubon Nature Institute, LSU AgCenter, USDA, the Louisiana Egg Commission, the Southern University Ag Center, and Louisiana Department of Agriculture and Forestry.